The Teaching With Small Boats Alliance (TWSBA) 2017 conference and 2017 Boat Engineering Challenge exemplified a common theme: students, not boats, should be the focus of maritime and marine programs. At TWSBA, sessions explored youth development, combated systemic biases, and exposed the diverse routes of post-programming opportunities. The conference, hosted at the Chesapeake Bay Maritime Museum (CBMM) from April 27 through April 29, brought together educators from around the world, pulling resources, ideas, and ambitions. The engaging CBMM campus turned teachers into students, creating an environment of constant learning and observation. The North American Marine Environment Protection Association (NAMEPA) kicked off TWSBA 2017 with the panel, “Ladders of Opportunity”. Carleen Lyden-Kluss, Co-founder and Executive Director of NAMEPA, illustrated the collaborative efforts made by academia, industry, small local groups, and large international organizations. She expressed a sense of community continually reinforced throughout the conference. “Listening to Your Students”, a session led by five TWSBA alumni, brought the event to an emotional and empowering conclusion. Alumni shared their experiences confronting life’s challenges, expressing the value of TWSBA programs, such as Rocking the Boat and the Alexandria Seaport Foundation. Boats engaged the students and apprentices, but the true value of programming comes from the communities they built and continually maintain. 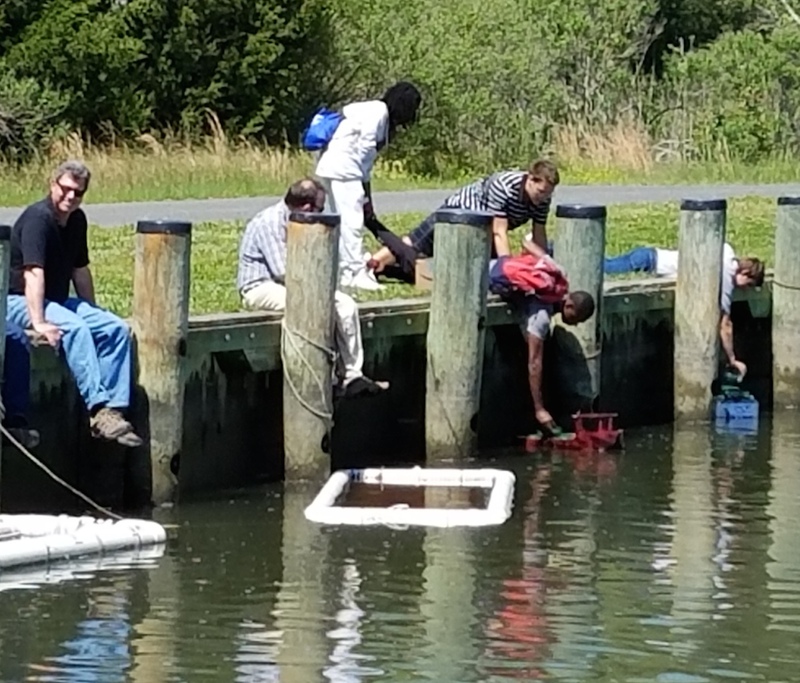 The second annual UMES Boat Engineering Challenge exemplified such community building. Seven teams gathered at the University of Maryland Center for Environmental Science’s (UMCES) Horn Point Lab in Cambridge, MD on April 28. The event, hosted by University of Maryland Eastern Shore (UMES) and UMCES, connected schools from Delaware, Maryland, and Virginia. The support of University of Maryland 4-H extension and Kelvin Educational broadened the community, providing professional and financial support. The TWSBA session on “Cooperative Programming” expressed the necessity of such support. Representatives of the Independent Seaport Museum of Philadelphia, the New York Harbor School, and Delaware’s Challenge Program explained how their organizations build relationships with other groups and community leaders. Community buy-in and support is essential for STEM program sustainability. The Educational Passage’s community, spanning 14 US states and including 13 other countries, connects participants and organizations via the ocean, a globally shared resource. Our cooperative programming includes schools and educators, but also includes government-affiliated programs, international research group organizations, educational non-profits, and shipping companies. To name a few, the NOAA Drifters Program, the jointly-operated PLOCAN research center, the National Marine Educators Association (NMEA), and Bermuda International Shipping Ltd. (BISL) have all assisted with various stages and aspects of our programming. These other organizations and industry leaders expand our students’ opportunities and our community’s reach. Together, we are on a mission to achieve global ocean literacy and sustainability. Our community includes organizations from countries, US states, and Canadian states colored blue in the map above.